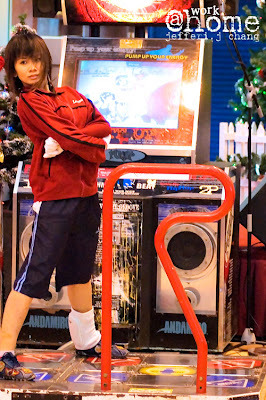 I attend the HobbyCon activities on today (8 December 2007) one day earlier because the couple who has an appointment photo shot with me ditched me at the last minutes. It look like this is a good day for me to have a look over what happen and snap some photos at there. I snapped lots of photo at the events but only got few good photos to share. It caused by not much interesting subject for me to shot because i actually came late for me. Then i met jullian and flanegan for first time at the spot. It seems that they stopped shooting for the day because of the camera batteries ran out for them. Jullian manages to reserve some of his camera batteries and took some nice shot while flanegan’s batteries camera seems to ditch him out and force him an earlier retirement on that day. 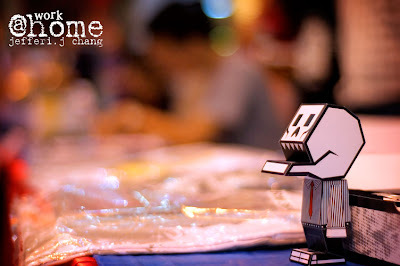 The small cute creature was created by ah Kwan as i, my friend used to call him. A long hair ponytail artist has been long time in art and design as we known. I’m not sure what kind of art is he doing but i pretty sure that he quite creative with his art and concept expression as one can see on the photo above and below. I myself trying to get my coordinate fixed on what really happen on that day. I was able to meet maslight for first time too. I actually confused with Joybee and Edgar. I thought at the moment that Edgar is Joybee and Joybee is Edgar. What a silly mistake. Sorry for that dude. It is nice to chat with maslight. 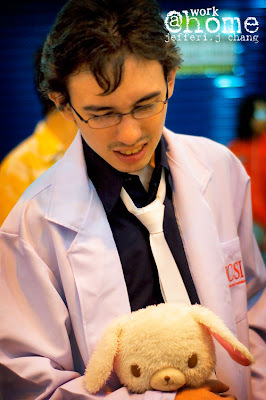 First, I wasn’t sure what Hobbycon is all about. Maslight told me that it is a forum where for hobbies enthusiastic to share, chat, discuss and meet. It seems that lots of talented comic artist setting up desks and showing up their artistic skills in comics. I myself an artist during school days today changed to computer and electronic medium such as photo and video camera to express my artistic hunger. 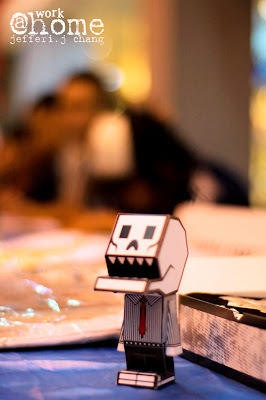 He is one of the characters that i think quite interesting enough for me to publish it in my blog. I don’t know what is he trying to portrait but i guess he trying to impersonate some tv series CSI character minus out the doll. Whether it is true or not, i didn’t know. I met Collin first time at Peter Tan and Wuan’s Blogger Gathering. 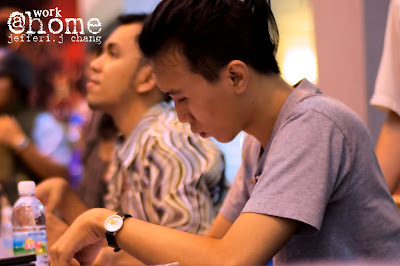 He told me that he actually specialized in graphic and web design and comic not really his full time. I found out that he was my junior while in La Salle. It is interesting enough to know that most of La Sallian ended up with arts. 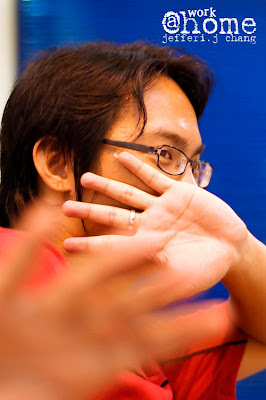 Nizam or NJay, his partner the main artist and illustrator in their comic publication. He partner up with Collin and to precede their dream on comic based art. Edgar, blogging live the Hobbycon event. He really did a great job of keeping everyone up to date of whatever happens if not by second or minutes, maybe hours. A range of video clip uploaded to YouTube and attached on his blog. For live blogging, he sure really put a good job over it. I myself didn’t use the internet facilities because i want to process my photo first before let other to see. I think that is my habits. Last, i snapped a photo of this mysterious man who don’t want his photo to be published and that what i did. An handsome lad that i knew online last time in chatting. I was part of a chatting channel forum that not quite held up long. I went to Sutera Open Air Christmas Carols By Candlelight in Sutera harbor after that. That i leaves it till my next post. 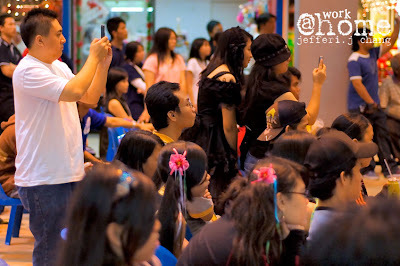 Meanwhile, for more information update about HobbyCon, there is a blog your can check it out. Jeez. Someone needs to work out. Looks like i just found my senior, besides Collin. Which is you! That’s a surprise! lol.. maslight i’m not really a sifu la. i am still learning.. and not god also.. no need to worship ler.. haha..
well.. all the shoot was GREAT!! thanks! Pat. Well i guess you are so busy with your work there or something else.. hehe.